A doctoral student in philosophy at the University of the Free State, Mark Amaridakis, recently reminded me of the important contribution made to philosophy — specifically the Critical Theory of the so-called Frankfurt School — by Max Horkheimer, one of the Frankfurt Institute for Social Research’s early directors. This made me pick up one of my books by Horkheimer – Critical Theory: Selected Essays (Continuum, New York, 2002) – which afforded me the rare pleasure of reading again some of the work of this early master of Critical Theory. 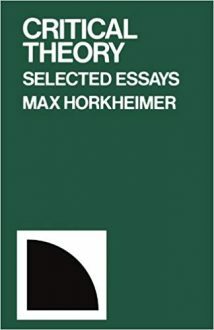 Horkheimer is probably known best by teachers and students of philosophy for his co-authorship, with Theodor Adorno, of a sometimes elliptical, but nevertheless illuminating book, Dialectic of Enlightenment, published in the 1940s at a time when the world was in the throes of a catastrophic war. This fact goes a long way towards explaining its sombre, pessimistic tone and its theme of the paradoxical metamorphosis of the historical process of enlightenment into a form of enslavement, by a transmogrified reason in the guise of technical-instrumental and administrative rationality. 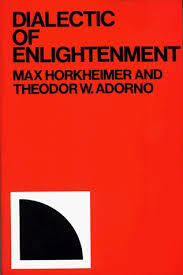 Recall that enlightenment is usually associated with the 18th- century Enlightenment, or discovery of universal reason, as the force capable of liberating humanity from fear of nature, superstition and from political oppression, then the irony of a situation of universal social misery — depicted by Horkheimer and Adorno in this classic text — will become apparent. It hardly requires a genius to realise that today humanity still faces a situation of ‘universal social misery’, despite proponents of the currently hegemonic economic system claiming otherwise — a brief reflection on the provenance of the saying, the 1% versus the 99%, should clarify what is at stake here. This obviously raises the question — at least to socially concerned world citizens – what ought to be, and can be, done to alleviate the present situation. More pertinently for someone like myself, a practitioner of philosophy, is there anything one might expect philosophy to be able to contribute to resolving the persisting conditions of suffering globally? In the essay, ‘The Social Function of Philosophy‘, Horkheimer has some interesting ideas in this regard, articulated in the context of the curious fact that, among the disciplines, philosophy is probably the only one that people cannot readily ‘place’ in society. Think about it — any reasonably informed person has hardly any difficulty locating medicine, law, chemistry, art, history, psychology, and so on, within a specific social field regarding its role or function. Yet, when it’s philosophy’s turn, they are usually at a loss, except perhaps for locating philosophy institutionally, that is, in the university. But does it have a social function beyond ‘higher education’? Ever since the trial of Socrates, it has been clear that they [philosophers] have a strained relationship with reality as it is, and especially with the community in which they live. The tension sometimes takes the form of open persecution; at other times merely failure to understand their language. They must live in hiding, physically or intellectually. The opposition of philosophy to reality arises from its principles. Philosophy insists that the actions and aims of man must not be the product of blind necessity. Neither the concepts of science nor the form of social life, neither the prevailing way of thinking nor the prevailing mores should be accepted by custom and practiced uncritically. Philosophy has set itself against mere tradition and resignation in the decisive problems of existence, and it has shouldered the unpleasant task of throwing the light of consciousness even upon those human relations and modes of reaction which have become so deeply rooted that they seem natural, immutable, and eternal. The real social function of philosophy lies in its criticism of what is prevalent. That does not mean superficial fault-finding with individual ideas or conditions, as though a philosopher were a crank. Nor does it mean that the philosopher complains about this or that isolated condition and suggests remedies. The chief aim of such criticism is to prevent mankind from losing itself in those ideas and activities which the existing organisation of society instils into its members. This was precisely the issue in the trial of Socrates. Against the demand for submission to the customs protected by the gods and unquestioning adaptation to the traditional forms of life, Socrates asserted the principle that man should know what he does, and shape his own destiny. His god dwells within him, that is to say, in his own reason and will. Today the conflicts in philosophy no longer appear as struggles over gods, but the situation of the world is no less critical. We should indeed be accepting the present situation if we were to maintain that reason and reality have been reconciled, and that man’s autonomy was assured within this society. The original function of philosophy is still very relevant. And one could add that, although these words were written by Horkheimer decades ago, they are still as pertinent to the role of philosophers in society as they were then. Moreover, it is obvious what contemporary society ‘instils into its members’, and should be the object of philosophical criticism.